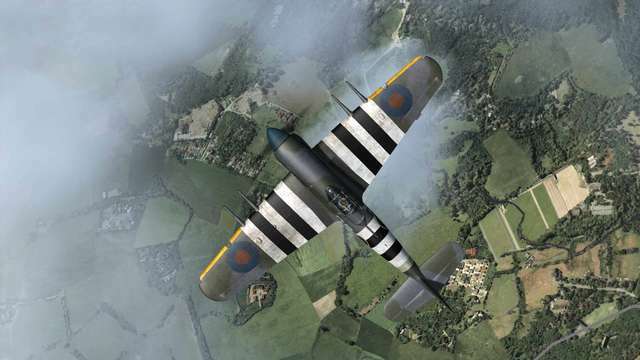 This simulation depicts the ‘Tiffy’ in Mk 1B form, at the height of its success from 1944 on. 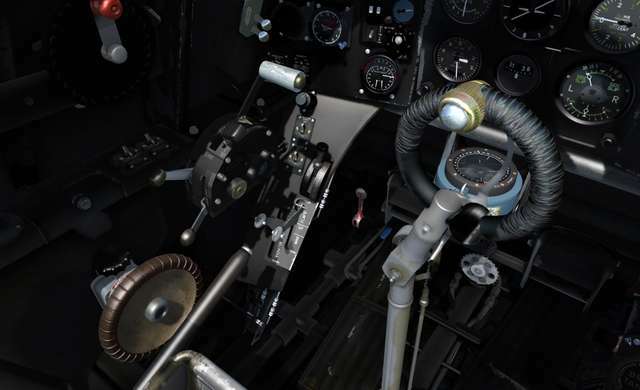 Hidden 'secret' navigation equipment can be toggled on to provide VOR and ILS guidance, GPS flightplans etc. 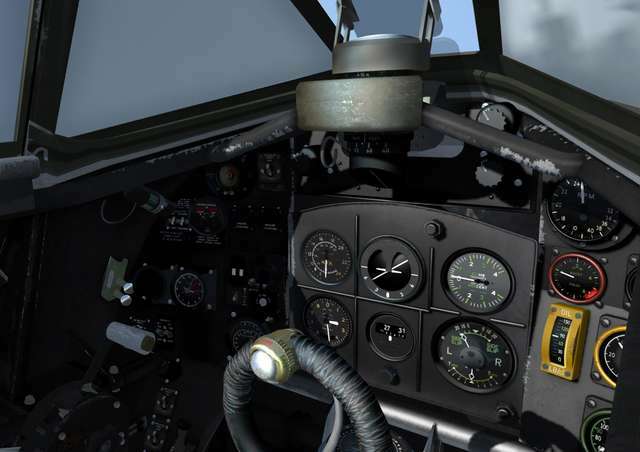 Flight dynamics are highly realistic and provide a challenge for the virtual pilot. 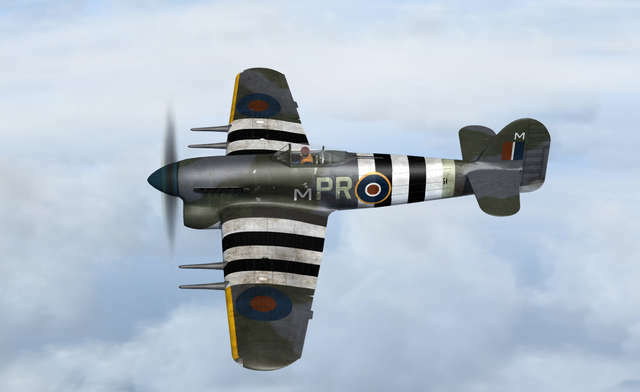 The 'Tiffy' was not a very easy aeroplane to fly, especially at slow speeds. 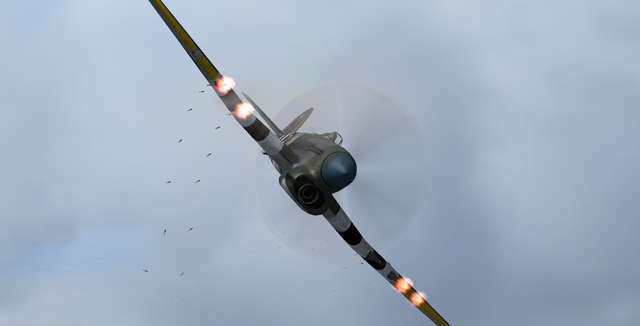 This is reflected in the flight dynamics. 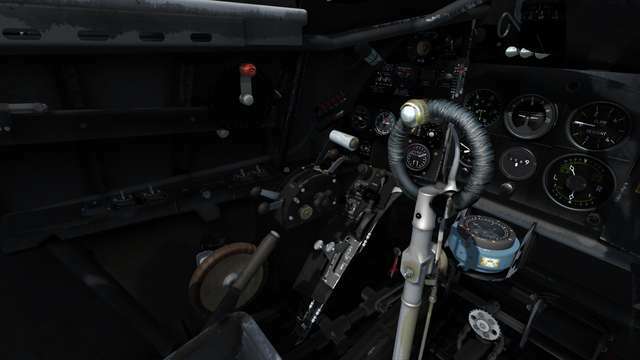 A more benign set of flight dynamics files are provided as an option for those who prefer a more relaxed experience. 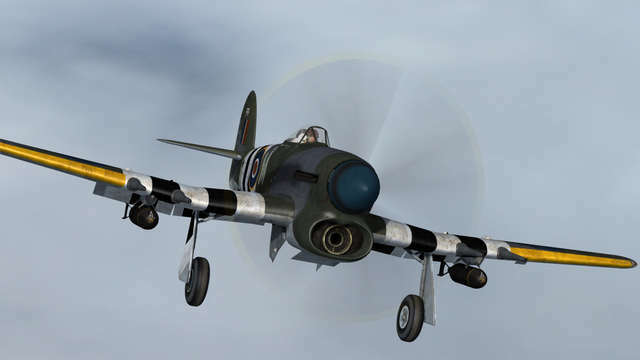 Fully engineered sound package includes the cartridge start effect and the characteristic supercharger whine. 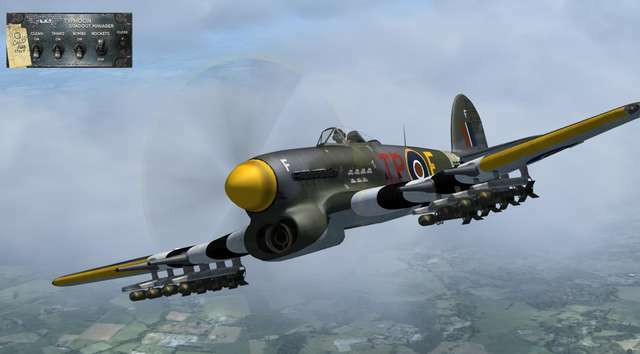 A Paint Kit (197MB) is available to download from the Support section. 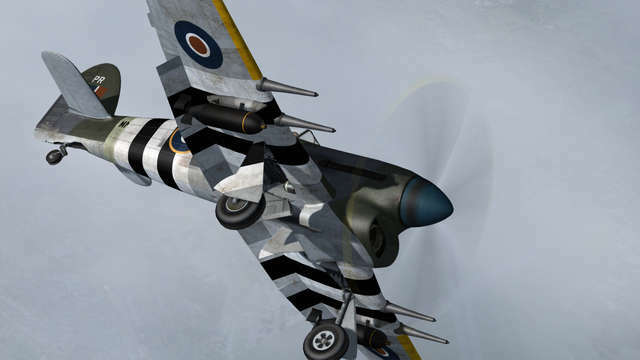 In 1938 the British Air Ministry issued Specification F.18/37 for a fighter, to be capable of at least 400 mph at 15,000 ft with an engine equipped with a two-speed supercharger. 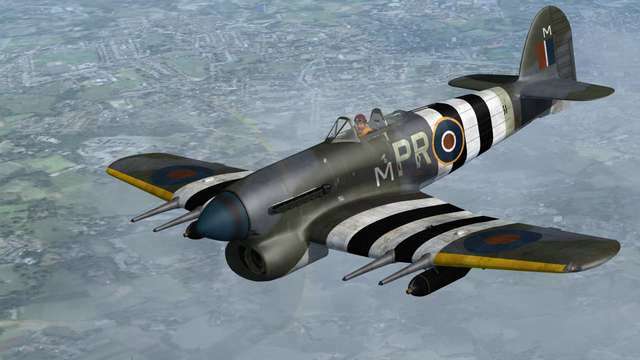 At Hawker, Sydney Camm, designer of the legendary Hurricane fighter, laid out designs for a successor to the Hurricane even before that masterpiece was to distinguish itself in the Battle of Britain. 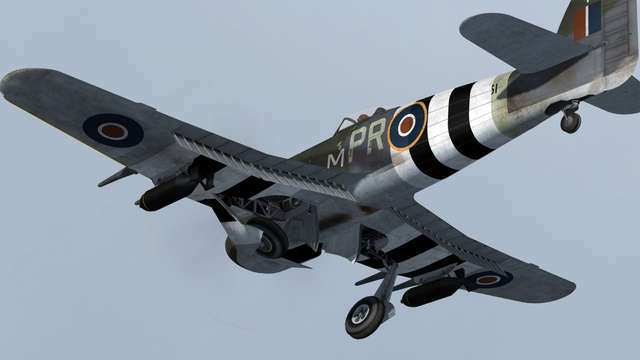 Designed to be built with traditional Hawker construction methods, the Typhoon was powered with the new Napier Sabre engine, an ‘H’ pattern 24-cylinder monster producing 2,200 hp initially, rising to a whopping 3,500 hp in later models. 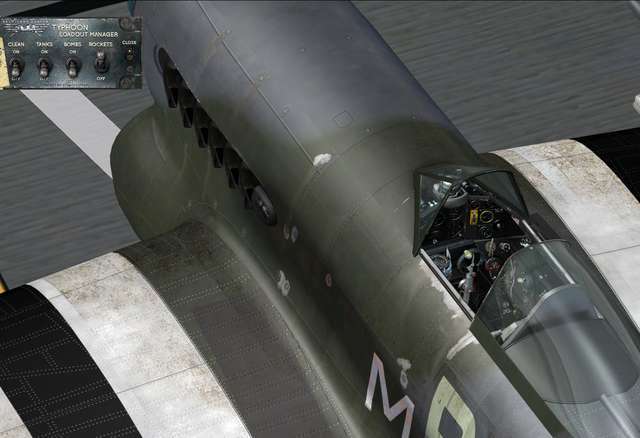 Initial Typhoons were built with ‘car-door’-style cockpit canopies with multi-pane glazing. 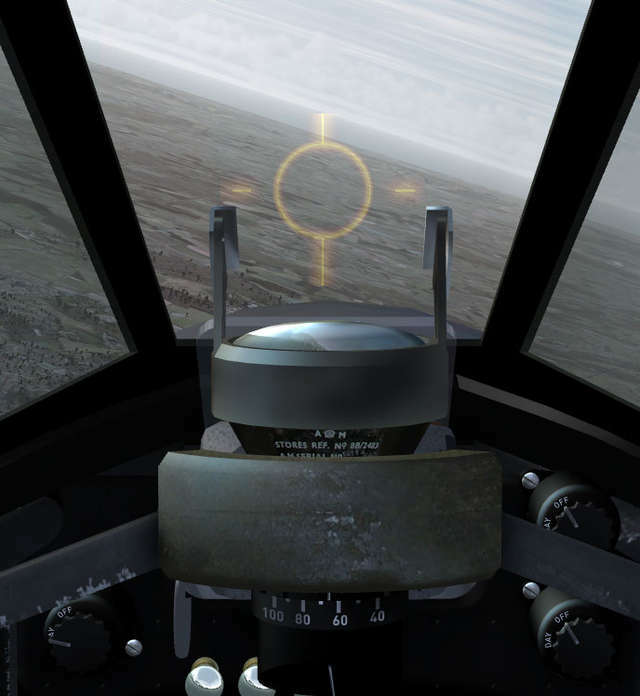 This was later replaced with a ‘bubble’ clear-view canopy which gave excellent all-round vision for the pilot. 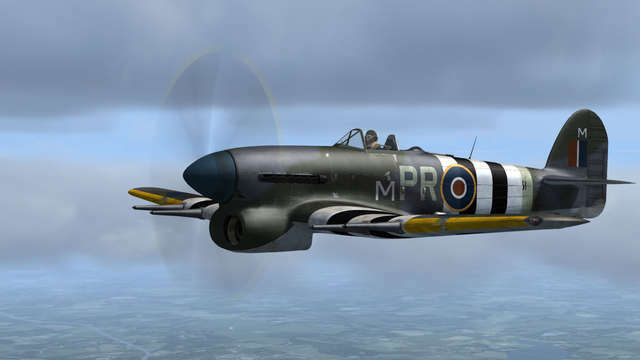 Many modifications and upgrades were incorporated in new Typhoons and retro-fitted to existing ones. 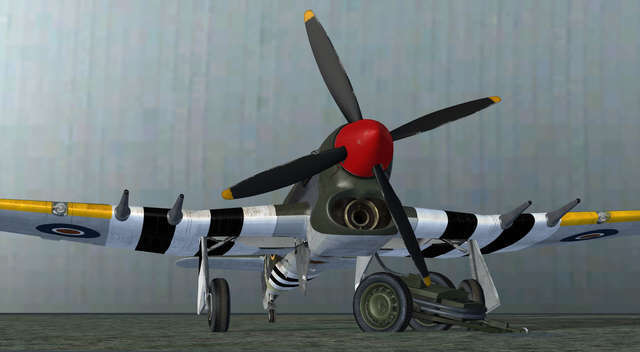 Early production Typhoons suffered from tail section failures under the high-stress conditions of diving. 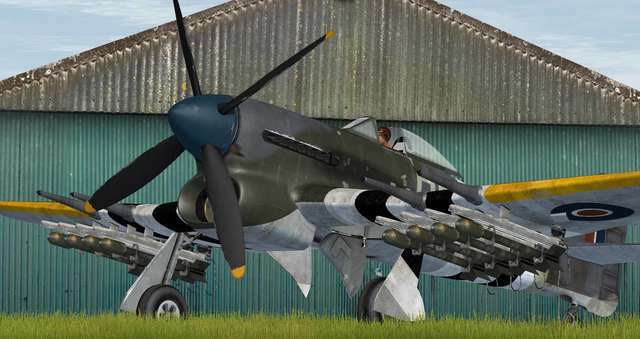 Responsible for 23 pilot deaths, tail structure failure was a major issue for the design team and ultimately all Typhoons were updated using a series of external fish-plates, riveted to the transport joint, ahead of the tail-fin. 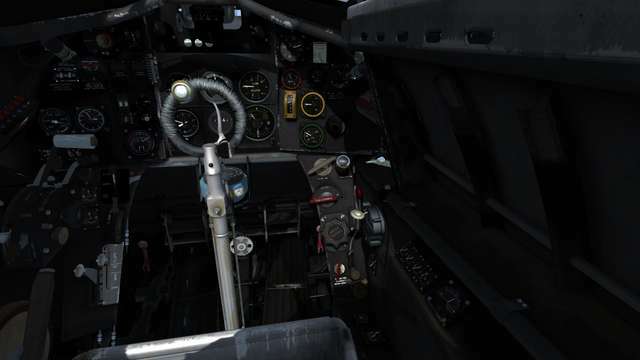 Carbon monoxide leaked from the engine compartment into the cockpit so pilots were ordered to wear oxygen masks at all times when the canopy was closed, even on the ground. 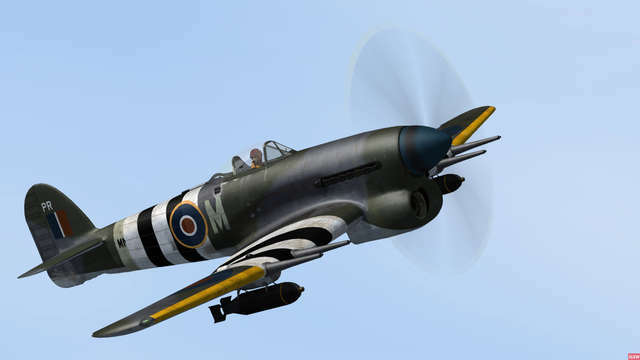 Despite these initial production problems and continuing changes, the Typhoon became one of WWII's most successful ground attack aircraft and with the addition of long-range external tanks could penetrate deep into enemy territory, disrupting industry, destroying transport systems and clearing the way for the post-D-Day campaigns. 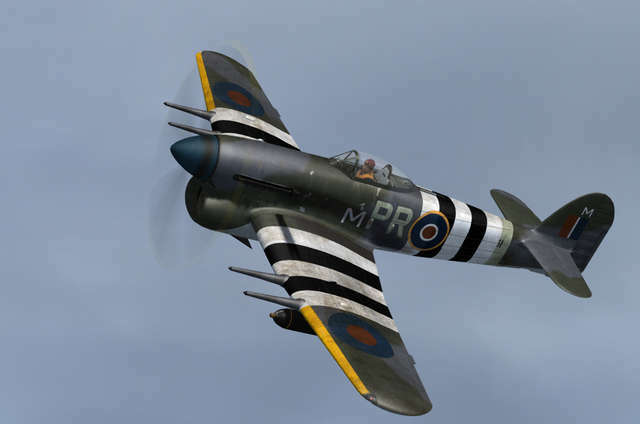 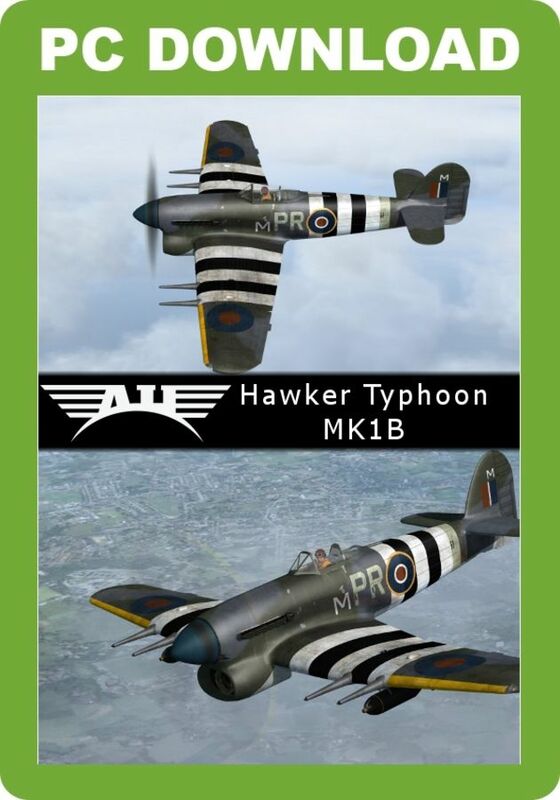 Aeroplane Heaven's Typhoon add-on for FSX and P3D brings you the Mk 1B variant with bubble canopy in six HD paint schemes. 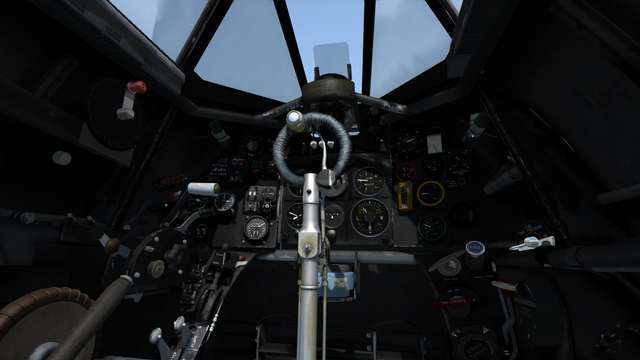 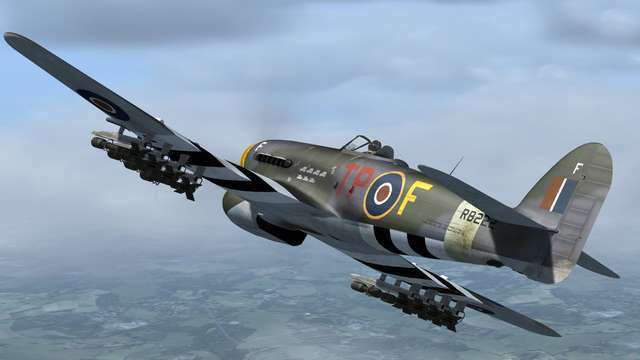 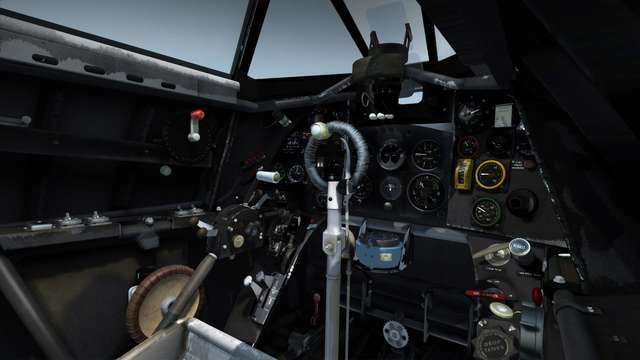 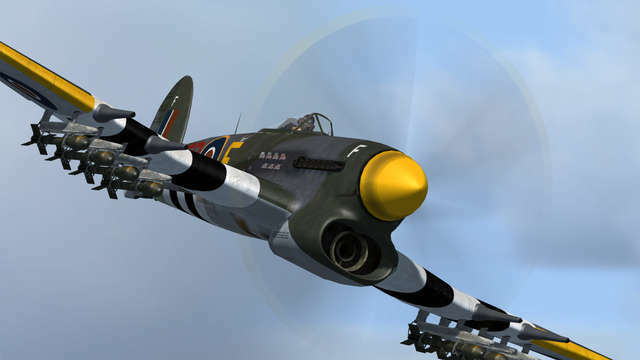 The model features selectable rockets, bombs and long-range tanks, gun firing and smoke effects, animated pilot, stereo sound set, numerous special animations and a fully functional, highly accurate virtual cockpit.